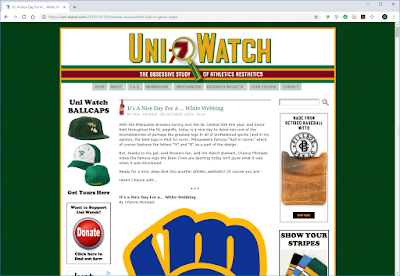 Uni Watch: "It's A Nice Day For A ... White Webbing"
To celebrate the Brewers' playoff run, I have a new piece up on Uni Watch this morning. It's the story of one very small mistake a quarter-century ago, and how that mistake has influenced our vision of the Brewers ever since. Well, the Brewers have done it. Twelve straight wins, meaning George Webb will make good on its 70-year old promise to hand out free hamburgers. 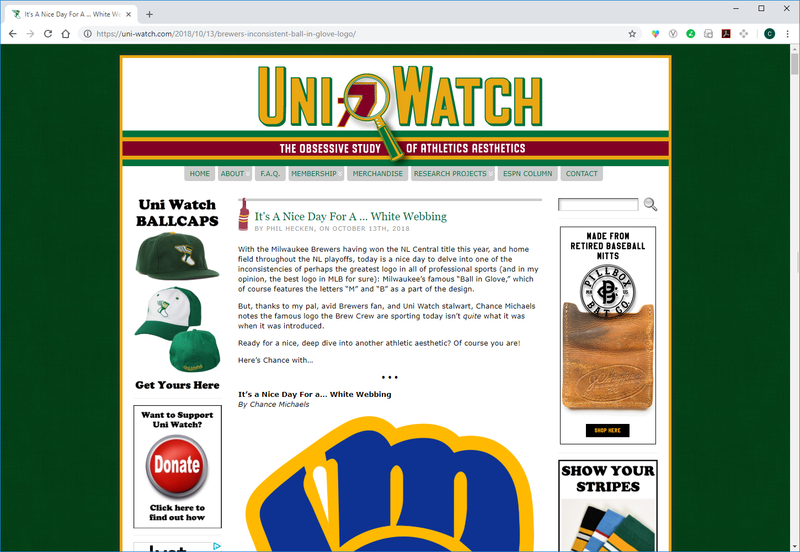 This is only the second time the local baseball nine has been able to come through; you can read about the first time in a piece I wrote back in 2013. The Washington Post has an article about our current Brewers and how they might make George Webb's famous prediction come true this week. 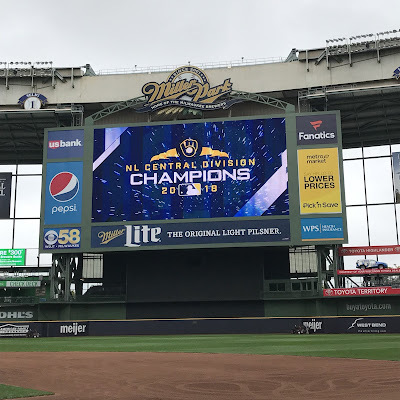 The Milwaukee Brewers are four wins away from their first trip to the World Series since 1982. But they’re only one win away from securing free hamburgers for all of Wisconsin for the first time since 1987. 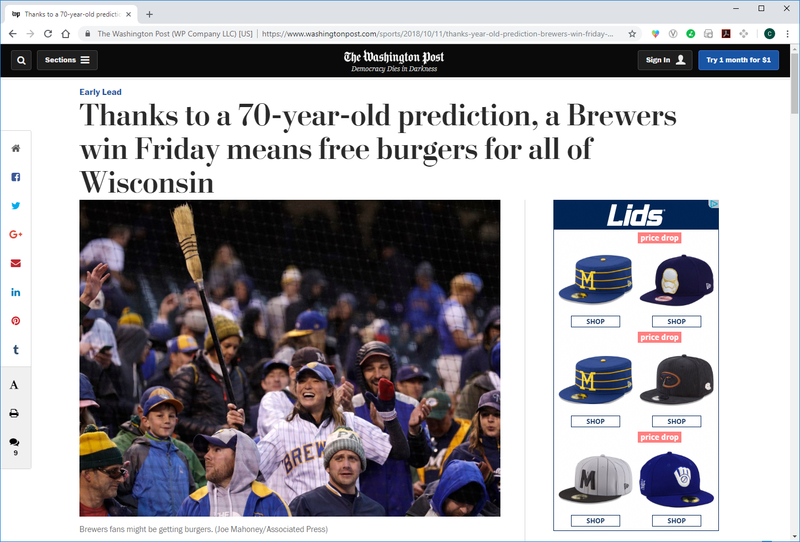 Local restaurant chain George Webb has promised patrons a free hamburger if the Brewers win 12 games in a row. Headed into Game 1 of the National League Championship Series, the team’s winning streak stands at 11, dating to a Sept. 23 win against Pittsburgh. Milwaukee has yet to lose in the postseason, including Game 163 against Chicago, played to decide the winner of the NL Central. 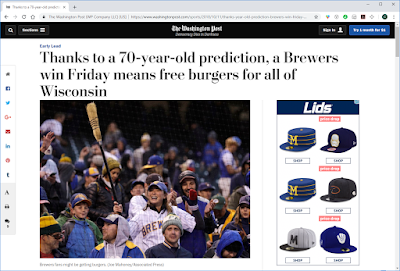 But the chain’s free burger promotion dates back to the 1940s and the minor league Milwaukee Brewers. Chain founder George Webb predicted that ballclub would win 12 straight games and hinted he’d reward customers if it did. Always good to see people remember that Milwaukee's baseball history goes farther back than 1953.